Welcome to another instalment of my *Face Mask Friday* mini blog series. 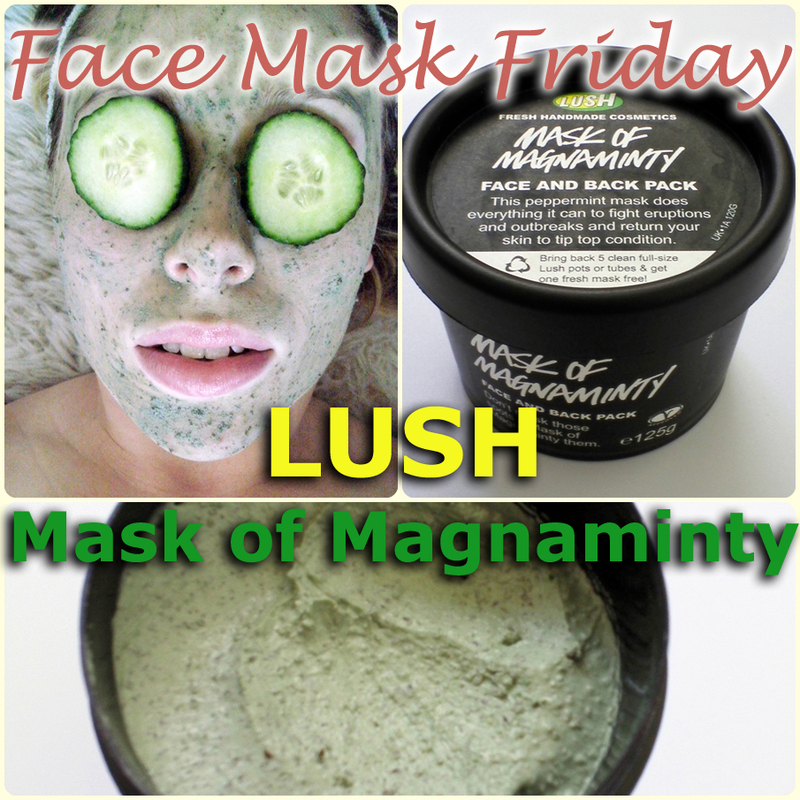 Today, I'm reviewing a classic Lush face mask: The 'Mask of Magnaminty'. I'm a bit of a face mask junkie at the moment and have been for a while if I'm honest! I love the fact that face masks provide a quick pampering treat whenever my skin needs it! I believe this product used to be called the 'Big Boy Face and Back Pack! According to Lush's founders, that name came from Adrian Mole (Age 13 3/4) and what he called "Big Boy spots which are those huge spots that take 2 days to come and 5 days to disappear"! The Lush Mask of Magnaminty is a traditional green face mask. To use, you simply smooth onto your face and relax for 15 minutes while it dries before washing off with a little warm water. This face mask smooths onto the skin really easily and the peppermint provides a lovely cooling sensation. Unlike the fresh Lush face masks, it doesn't have to be stored in the fridge but if you do keep it chilled, it's even more refreshing when applied to the skin. I really like the fact that before you wash this off your skin completely, you can turn this face mask into a face scrub with a little water. The ground aduki beans are great for exfoliating skin leaving it feeling soft and smooth. I have also found that this face mask lasts a long time which is great for saving pennies! If you have a back which is prone to acne, you can also use this product on there too which is quite interesting. By all accounts, this mask has been worked and reworked over the years to take it's current 'perfected' form. It's a lovely product and come next summer when I'm looking for cooling face masks once again, I may well repurchase this. Now winter is winter coming, I have my eye on a few sauna face masks instead. The Lush Mask of Magnaminty is available from Lush stores or the Lush website. It comes in two sizes: 125g (£5.25) and 315g (£9.25). Have you ever tried a Lush Face Mask before?